Viewed head on, the 5th generation iPod nano looks nearly identical to its 4th generation predecessor. But flip it over and, when you see the lens of a camera and a pinhole microphone, you'll know that this is a different iPod indeed. The differences are for the good: the 5th generation iPod nano is crammed full of great features and, at a low price, makes for a tremendously compelling package. Though it's not the sexiest feature of the nano, its iPod music player is still its core functionality and, as usual, the device excels here. The nano is ready to stock up on music (up to 4,000 songs at the high end) or photos, and it can play video. Music sounds great, of course, and moves quickly. I transferred 2545 songs—about 10 GB—in a snappy 22 minutes. One drawback, though, is that 10 GB worth of music occupies a lot of the device's total capacity. Capping out at a relatively low 16 GB, I’d expect to see the nano get a memory boost that will make the 16 GB model the low end (given its only $30 cheaper price, it’s hard to see the point of the 8 GB model). For now, storage for users with a lot of music will be a bit tight. Video looks solid, too. The smallish 2.2-inch screen won’t give you a widescreen experience, but TV shows and movies viewed in relatively low light look good (in brighter light the image is a little lower quality, but not much). The nano continues to live up to the images its name conjures. This tiny iPod is about the size of my palm—3.6 x 1.5 x .24 inches—and it weighs in at only 1.28 ounces. This nano is light and tiny, but never feels flimsy or easily losable. Though there are a bunch of interesting new features in the 5th generation nano, the highest profile is its video camera. The camera, visible only via its tiny lens and mic on the back of the nano, is more powerful than its tiny presence would indicate. It records video at 30 frames per second with 640 x 480 resolution. Apple has explicitly positioned the nano against Flip’s Mino video camera. The Mino offers the same resolution and frames per second, and costs US$149, but offers a maximum of 4 GB of storage (120 minutes' worth). I don’t have a Flip to compare to, so I can only review the nano’s video—and on that front, my verdict that it's solid, not spectacular. Picture quality is decent and the mic picks up audio well, though colors are a bit muted and low-light detail iffy (especially as compared on both points to video captured by the iPhone 3GS). When the shot involves quick motion, the video looks a little less smooth and natural than a higher-end camera would provide. Still, for short videos to share via MMS or upload to YouTube, this video seems pretty solid to me. The camera has 16 built-in special effects, ranging from security camera to fish-eye lens, allowing users to give videos a special look without any desktop video-editing program. This is a neat touch, and might be even neater if Apple allows third-party effects. I tested videos taken on both the nano and the iPhone 3GS and found that a roughly 1-minute video on the nano weighed in at 21 MB, while a slightly shorter video from the 3GS was 27 MB, indicating that the nano video didn’t pick up some things the 3GS did. With file sizes like that, the nano could store about 10 hours of video—not too shabby. The camera’s got its downsides, though: it can’t shoot HD, the video won’t look great on a TV, and it can’t take still images (apparently the nano isn’t thick enough for the required sensor). Perhaps the biggest downside, though, is usability. The camera is placed at the opposite end of the nano from the screen, making what you see onscreen and what you’re recording slightly out of position from each other. This isn’t terrible, but it takes some getting used to. It’s also easy to accidentally get fingers in your shot. Still, a little experience ought to overcome those drawbacks. Apple has long resisted including an FM tuner in the iPods, but has caved and included a tuner in this model. And, in keeping with Apple’s M.O., it’s done a great job. This isn’t any normal tuner. Using the headphones as an antenna, you can set favorite stations, tag songs you like to look up (and presumably buy at iTunes, if Apple has its way) later, and—best of all—record live radio broadcasts to the nano’s memory to listen to later. This feature, Live Pause, doesn’t save the stream indefinitely: if you tune away from the station, you lose the recording. Still, this is a terrific feature for those out, about, and listening to their favorite station. These feature additions would be enough to garner a good review, but the 5th generation nano adds even more features, including: a speaker to play music and other audio (not terribly loud, bass-heavy, or high fidelity, but suitable for previewing things); a pedometer that can upload exercise data to the Nike+ website through iTunes for workout tracking; a voice memos app; support for the VoiceOver ​accessibility kit; and Genius Mixes. Taken as a group, these features greatly expand the utility of the iPod nano and, while none of them will probably sell the device, they’ll help make using it much more enjoyable. While this iteration of the iPod nano has a few drawbacks (low capacity, only acceptable video quality), it’s hard to deny that this is a quality upgrade over the previous model. The video camera and FM tuner are splashy additions and continue to push the iPod to the head of the integrated media device roster. 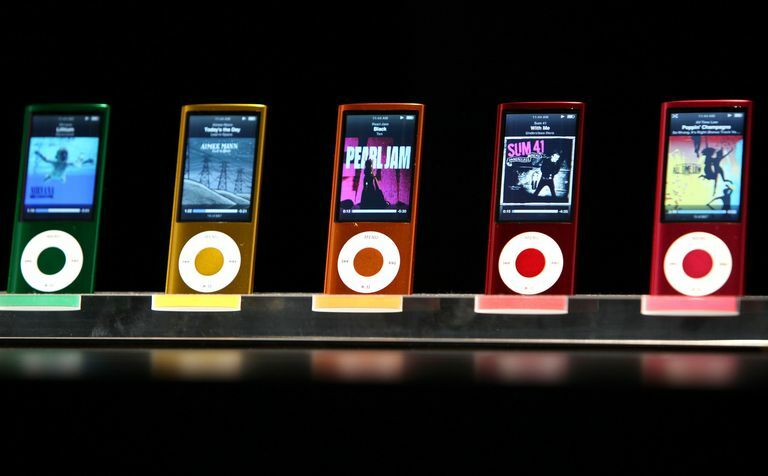 Given its low price and overstuffed feature set, and that the capacity issue will likely be addressed, it’s hard to ask for more from the 5th generation iPod nano.